Our dearest beautiful Sleazy left this mortal coil as he slept in peace last night. At the tender age of 20 he introduced himself to me. From that moment on I affectionately called him Sleazy and he became my dear friend, collaborator, experimentalist and explorer of life, loves and beyond. We got up to so many things, created so much music and art together, laughed, cried and caused havoc at times. What wonderful memories. Of all the many people I’ve known he was one of the very few who was genuinely kind with not a trace of malice in him. I can’t express the void his passing has created but in my grief I hold on to his wish not to be sad as he passes over into his next life with his heart melting smile and that arched Sleazy eyebrow. Cosey's work will be presented by A Palazzo Gallery in Turin at ARTISSIMA17 Art Fair. New York gallery Luxembourg & Dayan opened the exhibition 'Jeff Koons: Made in Heaven Paintings' on October 6, 2010. The show runs through to January 21 2011 and is accompanied by a new book with an essay from curator and critic Alison Gingeras which features Cosey's work. perform in Throbbing Gristle and returned to his home in New York. Throbbing Gristle has Ceased to Exist, at least as a live entity. at Archa Theatre, in Prague, Czech Republic on 30th October. It being too short notice to offer an alternative set. on 2nd November & at Casa Musica, Porto, Portugal on 5th November. looking forward to performing exciting new and radical electronic musics together. on 8th February 2010 in London. 'Women of the Underground: Music' is a new book of interviews by Zora von Burden. Ana Da Silva amongst others. ‘Mist While Sleeping' and 'Invisible Whispers’. 'Picture Industry (Goodbye to All That)' at REGEN PROJECTS in Los Angeles. ‘Harmonic Coaction’ at the Acusmatiq festival in Ancona, Italy. A live audio assimilation of person place and time. 'Harmonic Coaction' is a series of sound works constructed from audio field recordings relating to the performance site. The work is created live in situ using those recordings as key components, deconstructing and manipulating the sounds in juxtaposition and harmony. The accompanying visuals consist of images inspired by the site to create an audio visual continuum. Link to sound excerpt of previous 'Harmonic Coaction - Part One' performance. 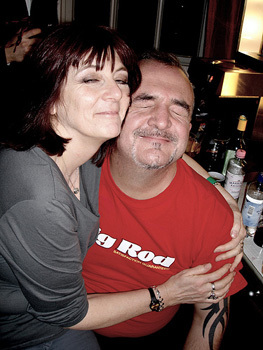 Cosey Fanni Tutti will be in conversation with Milovan Farronato at the Festival of Contemporary Art, Faenza Italy. Cosey's new art work 'Szabo Sessions' Vol.1 will be exhibited for the first time alongside 'Piccadilly' Magazine Action and supporting materials at '120 Day Volume' Part III exhibition at A Palazzo Gallery, Brescia, Italy. Cosey Fanni Tutti & Chris Carter perform 'Harmonic Coaction', a commissioned audio visual work for the opening of the show at A Palazzo Gallery. The sound work will be recorded and then installed as part of the exhibition. Cosey Fanni Tutti will be performing a live solo music set, with video, at the forthcoming Tate Modern 10th Birthday weekend event. To read it click on the diary & blog link on the left or click here . Readers can now also leave direct comments on the blog. A one-day event conceived by writer Maria Fusco and commissioned by the ICA, that builds on the shared interests of Fusco and Cosey Fanni Tutti around language and power relations, exploring the potential of ‘Cosey’ as a working method. The event will involve a range of artists, writers and other practitioners, who have all been asked to formulate contributions that enact and are inspired by ‘Cosey as Methodology’. Participants include Martin Bax, Gerard Byrne, Cosey Fanni Tutti, Daniela Cascella, Diedrich Diederichsen, Graham Duff, John Duncan, Anthony Elms, Babak Ghazi, Chris Kraus, Zak Kyes, Clunie Reid and Rob Stone. COSEY CLUB at the I.C.A. As part of COSEY COMPLEX (above) the ICA hosts COSEY CLUB, a club night that takes inspiration from the working methods and identity of Cosey Fanni Tutti. The event will feature performances and DJ sets, including the post-punk of Factory Floor, electronic supergroup Fixmer/McCarthy and pioneering DJ and producer Andrew Weatherall. Parallel Voices 2010 - MISSING LINK, 18th March in London. It seems some users in certain locations may have problems playing the RBMA video. Please bear with us while we try to track down the cause. 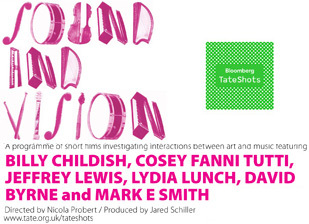 Tate Shots have just released a short film of Cosey discussing art and her music. University for the Creative Arts Farnham on the 18th February. Cosey is a guest speaker at the forthcoming Red Bull Music Academy on the 8th February. 'Pop Life: Art in a Material World' which includes works by Cosey is still at Tate Modern. National Gallery of Canada, Ottawa from 11 June – 19 September. Closed 17th January. Photos from the opening day can be found here.